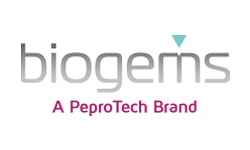 Through the establishment of joint collaborations with reputable manufacturers of top-quality life-science research products such asPeproTech Inc., BioGems has positioned itself to become a highly competitive source for a wide-range of recombinant protein and flow-cytometry reagents. Currently, our catalog contains more than 600 recombinant proteins and over 500 flow cytometry reagents. Biogems offers carefully selected portfolio of essential high quality antibodies/reagents for flow cytometry and related applications. Biogems offers a comprehensive line of premium recombinant protein & related products, which meet or exceed the industry standards for purity, performance & consistency. Small molecules are low molecule weight organic compounds that affect key biological pathways to allow for the control of cellular responses. BioGems is proud to offer a targeted portfolio of small molecules for life science research. Pre-Coated ELISA Kits from Biogems are Complete, optimized and ready to use kits with Guaranteed High Sensitivity and Reproducibility.